Though access to the Geshe studies curriculum has opened up to Westerners in the last few decades, it is still a rare and courageous breed who penetrates the womb of Tibetan culture to undertake this intense course of philosophical study and debate. In Act I, renowned scholar Geshe Georges Dreyfus, the first Westerner to receive a Geshe degree (and the only one thus far to receive the highest level of Geshe Lharampa), relates his first experience of Tibetan scholastic debate in an excerpt from his book, The Sound of Two Hands Clapping. For Act II, Ven. Jampa Kaldan writes to us from the Sera IMI House, a residential facility for Western monks undertaking Geshe studies at Sera Je Monastery. And what of Act III? That is up to you. The stage is set for the Western Geshe to become more than a remarkable anomaly: It may change the face of Tibetan Buddhist teaching in the West. My first encounter with Tibetan debates occurred during my stay at Nam-gyel in the spring of 1972, when monks from the three seats gathered in Dharamsala for a special session of debate. Because my Tibetan was then still rather poor and my knowledge of the tradition even more limited, I understood none of the debates. Nevertheless, I was fascinated by these dialectical encounters, which seemed so lively. I enjoyed their intensity and the dramatic atmosphere that surrounded them, an atmosphere that was greatly enhanced by physical gestures and sometimes playful verbal exchanges. I was also struck by the good humor of these spirited clashes. I remember watching the proceedings for hours, trying unsuccessfully to figure out what was being said. My experience was not unlike that of untrained Tibetans, monks and laity alike, who enjoy debate as a kind of spectacle. They may get a sense – at times misleading – of who is winning and who is losing, but they do not understand the topics debated. Lama Zopa Rinpoche visits Sera IMI House. 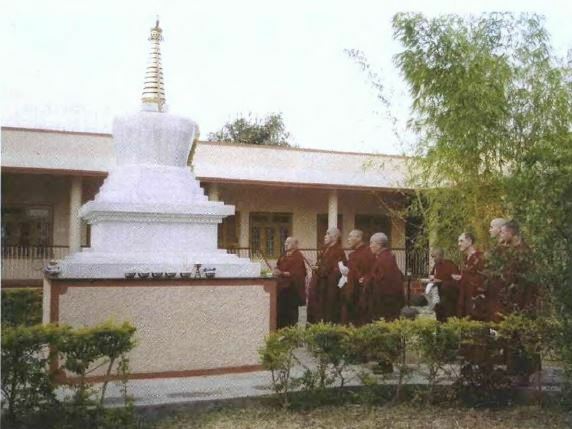 In the late 1990s, a group of Western monks, who were undertaking the Geshe Studies Program at Sera Je Monastery, thought it may be beneficial to build a residential facility at the monastery for Western monks. After some discussions, FPMT Spiritual Director Lama Zopa Rinpoche advised that this should be done, and the construction of a cloister-style building was begun. Completed in early 2002, with fourteen individual rooms, a puja room, library, teacher’s room, office, kitchen, and bathrooms, it was given the name Shedrup Zungdrel Ling, commonly referred to as Sera IMI House. 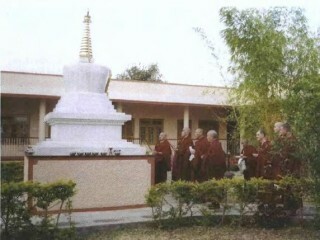 The House also serves as part of the International Mahayana Institute (IMI), the Sangha branch of the FPMT. The tradition at Sera and other monasteries is for monks from the different areas in Tibet to live together in their own house-groups, thus providing a home away from home. In accordance with this, for example, the Nepalese IMI monks have a separate house-group at Sera called Kopan House. The purpose of this project, therefore, was to provide good quality accommodation and a supportive community for Western, and other non-Himalayan monks, modeled on the lines of these residential house-groups. The key aim was to make it more feasible for Western monks to be able to come and live long-term at Sera, and to be able to participate in the traditional eighteen-year program of studies leading to the Geshe degree. Lama Zopa Rinpoche named the project Shedrup Zungrel Ling, which means “sanctuary for the unification of teaching and accomplishment.” This title actually describes beautifully the function of Sera Monastery in general: that is, a place to focus on the intensive study of the teachings of Buddhism within the context of being a monastic community devoted to the practice and inner realization of these teachings.